Last Friday evening I played fangirl with my friend L at the Melbourne Writers Festival, and we needed dinner afterwards. L loves all things Japan so, recalling a recent post on melbourne gastronome, I booked us a table at Hihou. Their online booking system is easy-peasy and even allowed space for me to mention our dietary requirements. Finding Hihou itself is a little more difficult; even with due warning I had to double back before trying the unlabelled buzzer. Once we'd plucked up the courage we were ushered upstairs to our table and presented with a drinks list, our waiter confirming our dietary requirements and supplying a menu with vegetarian and gluten-free items marked by hand. While there were all manner of cocktails, sake and plum wine on offer, I needed to go alcohol-free. The bar staff compensated expertly, giving me a glass that graduated from lemon-spritzed soda to fruity sugar syrup then thick, tangy passionfruit pulp. Soon we were digging our chopsticks into the lightest, crunchiest of vegetable pickles ($5) and creamy miso edamame ($5). At this point my camera battery shut down. We battled on with two smart phones, though we were not the smartest of operators. Forgive me for the strange pictures that follow! After all, mochi spring rolls ($3.50) deserve documentation. Crispy outside and fudgy inside, they made perfect sense once dipped in the jammy tamari soy butter, and were enhanced further with intermittent nibbles at the pickled vegetables. 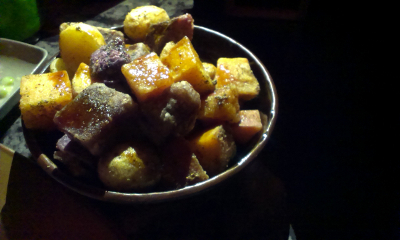 I cheekily looked past the salad and elected to fill up on fried root vegetables ($10), starchy cubes of orange, purple and gold doused in a tamari caramel that pooled in the bottom of the bowl. We left room in our hearts, and just barely our stomachs, for dessert. The warm yuzu tofu cake ($11) was a seamless meld of bean curd and sponge cake, dense but springy with the gentlest vanilla sweetness; all its richness came from the white chocolate sauce on top. The chocolate shochu brulee ($11) had a similar tofu mouthfeel, but was shot through with booze under a scorched-chocolate sugar shell. Hihou is very cool, but the staff never let on that they were too cool for us. They largely left us to ourselves, yet ensured that we had everything we needed. It was an ideal venue for finding our own little nook to lounge and laugh for a few hours, delighting over their meticulously prepared bar snacks. Besides the melbourne gastronome post that got us there, Hihou also comes recommended on Where Adles Eats, Melbourne Epicurean Eats, My Friends Call Me George, grazing panda and MEL: HOT OR NOT. Accessibility: Hihou is located up a flight of stairs and I didn't see a more accessible alternative. There's a mix of high stools and low chairs, all closely packed, and the restaurant is only dimly lit. We received full table service, and didn't visit the toilets. January 2016: United Arab Eatery has moved up the road to 107 High Street in Preston. It's still being run by the same people and the food seems basically the same, although we've yet to check it out. One of our Northcote friends fervently recommended United Arab Eatery to us. Its owners used to run Munsterhaus, which goes some way to explaining the salad selection - a rotation you can mix and match to eat in or take away. Since we were eating in we took more interest in the a la carte options. Unlike Munsterhaus there is meat on the menu, though it's involved in less than half the dishes. Humming and hawing over the veg options, we could easily have constructed a second, just-as-exciting feast without repetition. There aren't any pointers for those with special dietary requirements - many of the vegetarian dishes mentioned dairy, and bread abounds, so we'd recommend checking with the staff. We started with one of their specials, eggplant and potato croquettes ($12). They were crispy-crumbed but soft, sweet and a little starchy inside, and each one nested in a different sauce - juicy red pepper, smoky babaganouj and (my favourite!) preserved lemon mayonnaise. In a fritter frenzy, we also ordered falafel ($11), a mini-meal with garlicky yoghurt sauce, babaganouj, pickles and a quinoa-based tabouleh. This was accompanied by fluffy hot flatbread (not pictured) with delicious charred dots - I wonder whether its tenderness might have come from yoghurt in the dough. We rounded out our meal with a hearty dish of mushrooms, lentils and goats cheese ($15) You should have seen Michael's face when I offered him a second whole mushroom to himself! Even then, he scooped every drop of lentil gravy he could salvage from the bottom. We agreed that we had time and stomach space for one dessert, and picked out the bitter orange Arabian doughnuts with syrup and yoghurt sorbet ($9). These fellas were dense, and the rolled sugar and syrup created a surprising sherbet sensation on my tongue. We shared the sorbet as politely as we could, given how light and refreshing and tempting it was to sneak a bit extra. UAE has limited seating, so you'd do well to head in early for the dine-in menu, or just order takeaway instead. Either way, it's not difficult to flag down staff when there's so few places for them to hide! We thoroughly enjoyed what they had to offer and eagerly anticipate the many vegetarian dishes we've still not yet sampled. UAE has received positive write-ups on my mini manifesto and Lisa Defazio. Accessibility: I think the entry's flat, but the interior is very crowded. We ordered at the table and paid at a high counter. We didn't visit the toilets. Catching up with the Moody Noodles gave us just the excuse we needed to trek across town to Balaclava for breakfast. Despite Monk Bodhi Dharma's varied vegetarian menu, brilliant coffee and generally good vibes, we're lucky to make the trip more than once a year. We turned up pretty early this Sunday, which meant we could waltz right onto a table without the customary queuing (by the time we left 10:30 or so there was a bit of a line-up by the door). The menu is all vegetarian and egg-free, with plenty of vegan dishes (in fact, they'll do a vegan version of nearly anything on the menu). It's a pretty sweets-focussed menu, with apple pancakes, breakfast trifle, fruit salad and muelis. So it was somewhat surprising that Cindy went savoury, ordering Marlo sweetcorn ricotta hotcakes with slow roasted cherry tomatoes, basil pesto and sour cream ($16.50). I think of ricotta hotcakes as being served up with syrup and fruit, so this seems like an odd combo to me. It hit the spot though, with three thick corn-stuffed fritters and abundant condiments she stoically polished off every skerrick seemingly hours after the rest of us were done. I made speedier work of the umami mushrooms (slow roasted king, shitake, oyster and Swiss brown mushrooms on pumpkin, spinach and sun-dried tomato polenta bread with goats cheese, thyme and red chilli oil, $18.50). This is all about the mushrooms - rich and hearty with really satisfying savour flavours. The goats cheese provided a bit of salty pungency to cut through, and the dryish polenta bread served as a good mop for all the mushroom juice. An excellent winter brekkie. Monk Bodhi Dharma is a consistently excellent brunch spot - the coffee was great as always, and the food top notch. Staff are friendly and pretty efficient, churning people through the tiny space without too many problems. We'll be back again... in another year or so. Our last trip to MBD was for dinner, but we've been semi-regular brunch visitors as well. Since last time, Monk Bodhi Dharma has been enjoyed by Mel to NYC, alextroup, Twelve Days, The Good Hearted, The Coffee Guide and Kish and Co. Accessibility: MBD has a narrow entry with a small step and very cramped interior; most seats are small heavy backless stools.We ordered at the table and paid at a medium-low counter. We've enjoyed cheap takeaways from Nasi Lemak House for a few years and missed them when they closed for renovations for a number of months. They've now re-opened as NL House with a trendy new look and less seating, indicating a shift towards takeaways. The equally bright young staff member behind the counter was super-helpful and would be the perfect adviser for anyone making their first foray into Malaysian food. The current menu is shorter than before - the two notable veg options are NL (nasi lemak) tofu ($8.90) and laksa veg ($9.50). To the best of my knowledge they're both vegan and the laksa is gluten-free*. On a blackboard they promise that past dishes such as char kway teow and mee goreng will return at some point. It's certainly a simpler, takeaway style nasi lemak that we're served. The basic version consists of coconut rice, fried tofu puffs, peanuts, a light and crunchy pickled vegetable achar, and traditional or sweet kelantan sambal (both of which we believe are shrimp-free). The cucumber and fried egg they used to include are now available at extra charge, and the pappadums appear to be entirely absent. I liked the pickle, and the sambals have a helluva kick, but I found the box unwieldy to eat from. We both sipped teh tarik ($3.80) to quell the sambal spice, and I gazed at the other neon drinks and jellies. With this perky makeover, NL House has lost some of the features we were fond of - the seating, menu and nasi lemak have all been stripped back to a minimum. The food remains cheap and tasty, even if they're cunningly charging more for extras that previously came standard. And since it's all getting served in boxes, you now may as well order takeaway and take it down to the park. *We've since received an email from reader Scarlett indicating that the sambal and stock might not be as veg-friendly as we thought, so question the staff to your satisfaction before ordering. You can read about our first visit to Nasi Lemak House here. The new incarnation gets the nod on Asian Restaurants in Melbourne. Accessibility: The door has a small lip to accommodate the sloping footpath. Tables are quite crowded both inside and outside. We ordered and paid at a low-ish counter, then received our food at our table. We didn't visit the toilets. We needed a simple meal to get us through the ludicrous task of packing up our house - moving always leaves you eating takeaway for the best part of a week, so we also wanted something healthy. Luckily, the calendar recipe this month delivered - a very straightforward dahl recipe loaded with lentils to fill us up and give us something nutritious. There's really not much too this - some onions, lentils and a decent combo of spices. It's warm and hearty, with a mild chilli kick and some ginger and lemony tang. Using the ground up cardamom pods really makes a difference as well - the cardamom flavours came through strongly. Combined with a fresh baguette from Baker D Chirico and you've got yourself a pretty tremendous meal. Heat the oil in a large saucepan, add onions and then cover and cook for about 5 minutes - they should go nice and soft. Add cardamom seeds, garlic, turmeric, ground chilli and ginger and stir-fry for another five minutes or so. Add the lentils, stock and bay leaf and bring the mixture to the boil - drop the heat down so that it's just simmering. Cook uncovered for about 25 minutes - it'll thicken up nicely (the photo above is from the day after, when the lentils had soaked up even more of the liquid - it was still a bit soupy on the night). When it's ready to eat, stir through the lemon juice and season with salt and pepper. I could not let a brunch potluck pass by without making waffles. Keen for something new, I flipped open Vegan Brunch and landed on the gingerbread waffles - not only did they sound excellent, they'd clear my soon-to-be-packed-up pantry of treacle. While they were made of the right stuff - brown sugar and said treacle, fresh ginger and a touch of cinnamon and cloves - they didn't conjure gingerbread quite as I'd hoped. The cooked unevenly, with odd little black patches that were not charmingly caramelised; I also wonder if I would have preferred dried ground ginger to the fresh stuff. Still, they were waffles and they were abundant, cooked 14 hours in advance and served alongside a toaster for up-to-the-minute crispness and a bowl of stewed, ruby-hued fruits. A couple of crunchy rhubarb stalks aside these fruits were just what I intended, saturated with their own syrup and still holding their shape, pink sweetness spiked with almost-acid orange. Wash and trim the rhubarb, then chop it into 5cm lengths. Wash and halve the strawberries. Peel and segment the oranges such that the pith and membrane are entirely removed (like this). Place the rhubarb and sugar in a large saucepan. Stir them over medium heat until the rhubarb begins to soften around the edges. Stir in the strawberries. Continuing cooking, stirring occasionally, until the rhubarb is tender. Take the fruit off the heat and add the orange segments, and cool the fruits to room temperature. When we first moved to Melbourne, we really weren't expecting to settle in to our Carlton apartment for the long-haul. It's been seven years now and, after devouring all that the neighbourhood had to offer, we're finally moving on (don't worry, we're not going far!). Our current apartment has been the site of a few excellent vegan potlucks over the years (most notoriously Cindy's ice-cream themed birthday potluck, which left me with a massive sugar hangover), so we decided to throw a final celebratory potluck to say farewell. We went with a brunch theme and everyone came through with the goods - there were sweet and smoky baked beans from Johanna, a tofu quichey thing from Veganator, wondeful pastries from Vicki, spicy noodles from The Simple Eater, quinoa soy bombs from AOF, chocolate pudding from Lisa plus deep-fried amazingness (including Oreos! ), berry cornbread, cauliflower curry and on and on and on. Incredible. I decided to go for a veganised version of McMuffins, combining this brilliant omelette recipe with some old-fashioned tempeh bacon to create a salty, eggy treat. We originally talked about making our own muffins from scratch, but time got away for us (besides, the white-bread muffins we bought were probably closer in spirit to what Maccas serve up). I realised too late that real McMuffins actually come with a soggy puddle of cheese on top of the bacon and egg, so these were even less authentic than you'd expect. Instead, we gave our guests their choice of sauces to slather on - my favourite combo was a generous squirt of tomato sauce with a drip or two of Sriracha. I was really happy with how these turned out - it's not actually that much work (or at least it wouldn't be if you were making four rather than twelve), and they really were fantastic. The ability of black salt to turn silken tofu + seasonings into something eggy never fails to blow my mind. I'll definitely be testing out the kitchen in our new place with a batch of these pretty soon. When Footscray Food Blog declared that Mamak to make Melbourne's best roti, I took notice. This Malaysian style of snackery isn't well known for its veg options but I could dream of the dessert breads, stuffed with bananas and dripping with condensed milk, couldn't I? 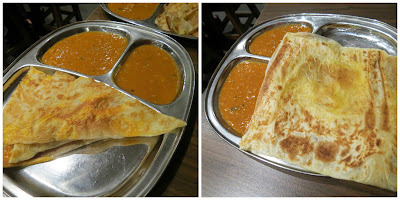 More recently Nouveau Potato revealed that Mamak's roti canai can be adapted for vegetarians, a tip that had us heading over for a quick Friday night dinner. The options available to vegetarians are less than crystal clear, and vegans and coeliacs will be more perplexed still. But our encounter with a waiter reassured us immensely - she checked that we wanted shrimp and anchovies omitted from our meals and even seemed to have buttons for the purpose set up on the PDA to click through to the kitchen. We could barely believe the swiftness with which our food arrived! First, two rotis with double dahl and no (shrimpy) sambal. The roti telur ($6.50) was stuffed with fried egg, a filling roti/omelette hybrid. The roti planta ($6.50) was yellow with brushed butter, and lacking crunch as a consequence. While they were both great, I harboured a little order envy for the crunchy balls of roti canai we spied at neighbouring tables. The nasi lemak ($9) with vegetarian curry ($3) had a little fragrance and heat, but we missed the sambal (and a half boiled egg seemed a little stingy!). As vegos, it's more rewarding to DIY on this dish. We tamed the heat with frothy stretched beverages - a teh tarik ($4) for me and a half tea/half coffee cham ($4) for Michael, both milky-sweet with just a bit of bite. Mamak is enormously popular and known for causing queues on Lonsdale St. Still, they don't waste anyone's time - we were seated within five minutes and our food was served in a flash. And amid all the bustle the staff we encountered were equals parts chipper and efficient. I'll gladly return for a fast and friendly roti. A vegetarian perspective on Mamak has already been posted on Nouveau Potato. It also gets a tick on The Very Very Hungry Caterpillar, egg tarts and apple pie, Footscray Food Blog, The Bake-a-nista, PETIT MIAMx, temasek, foodie about town, twoMunch, Gastrology, peach-water, Sweet and Sour Fork, Deconstructing Comestibles, theycallmemaggie, Yellow Eggs, Gourmet Chick, And Lashings Of Ginger Beer, Foolish for Food, le bon vivant, The Epicurean of Southbank, new international students, Pigging Out Around The World, The Misadventures of MissC, Foodscrazy, ohdenny., Asian Restaurants in Melbourne, Not Just an Auditor, LIVE TO EAT, Couture Foodie, It's an expensive but delicious habit., Fika & Kuidaore and The Food Society, while its weaknesses have been picked up by EAT AND BE MERRY, FOR TOMORROW WE DIE(T), mangiabeve, Ichigo Shortcake, Biting Travels, Barley Blog, The Chronicles of Ms I-Hua & The Boy, Suburban Culinary Adventures, GOOD FOOD GOOD MOOD, Lots of Cravings, The Chicken Scene, Edesian Feast, confessions of a little piggy, and Burp! Appetit. Accessibility: I think Mamak has a flat entry. Tables are crowded but corridors are well-defined. We ordered at our table and paid at a low-ish counter, crowding up that corridor, out front. We didn't visit the toilets. We've become quite slack about Northcote, only really exploring all the cafes and restaurants if we're in the neighbourhood for other reasons. This Sunday evening we'd hit up Women of Letters and were on the prowl for an early dinner. We'd had word that the veggie menu at The Wesley Anne had hit new heights, but the miserable weather made its only spare tables (in the courtyard) unfeasible. We needed something close by with indoor tables and good veg options. Cindy poked around on her phone for a bit and came across Vegematarian's endorsement of conveniently located Lâm Lâm. Problem solved. It's a pretty basic looking place - not somewhere you'd go for a relaxed or romantic dinner. Lâm Lâm is about serving you cheap fresh food quickly and then getting you on your way. There's no shortage of demand - it was basically full when we turned up at 5:45pm and stayed that way for the next hour or so. Throw in a steady stream of takeaway customers and its clear that Lâm Lâm has found itself a market in Northcote. The menu is massive, with a small section of well-marked veggie options. We thought about the char kway teow ($11.50) or the mi goreng ($11.50), but couldn't resist Vegematarian's suggestion of the crispy bean curd with spicy salt ($11). This was served with a tangy and spicy clear sauce and was excellent - it's hard to go wrong when you deep-fry tofu with loads of spices and salt. To counteract the fried-ness, we also ordered the rice-paper wraps, stuffed with tofu, veggies and noodles ($8). These were a pretty reasonable rendition, although some of the fun gets taken away when you're not building your own. The filling was probably a bit heavy on the noodles and light on the tofu and veggies for my tastes, but the thick and spicy dipping sauce made sure every bite was delicious. Our final dish (which was pretty unnecessary - we were both pretty full after the first two) was the rice vermicelli with veggie spring rolls ($9). We almost always order this dish when it's an option - there's something very satisfying about stirring little deep-fried spring-roll chunks through a noodle dish and pretending that it's okay. This was another decent effort - the spring rolls were delicious, there were a reasonable amount of veggie pieces and the noodles were good. It won't change your life, but it will do an excellent job of filling you up for $9. Lâm Lâm is a cheap and speedy dinner option in Northcote - as Vegematarian notes, it really has the feel of Victoria Street rather than High Street. I wouldn't suggest heading to Northcote specifically for a visit, but if you're in the neighbourhood and feel like a quick and satisfying meal you could do far worse than stop in. A few bloggers have enjoyed Lâm Lâm - Vegematarian's post was our prompt to visit, while Happy Nation and The Tasty Dozen were also impressed. Asian Restaurants in Melbourne and Juganaut's Foodie Thoughts had less enjoyable experiences. Accessibility: Lâm Lâm has a flat entryway but is pretty crowded inside. You order at the table and pay at a low counter. We didn't visit the toilets. Here's a simple salad that sits equally well on a dinner plate, at a potluck table or in a lunchbox. Pumpkin and chickpeas supply all the carbohydrate and protein power needed to consider this a whole meal - not to mention the flavour spikes from lemon, ginger and coriander - but it could equally play side salad to baked tofu, a stuffed vegetable or curry. Slicing and baking pumpkin can be a minor hassle, but there's little more to this recipe; it probably only needs 10 minutes of active time in the kitchen. We're having a slightly harried month, and Robyn's Recipe Calendar could not have offered us a more relevant recipe. Place the pumpkin cubes and garlic cloves in a large baking tray and drizzle over half the olive oil, tossing it through the pumpkin. Bake the pumpkin for 20-30 minutes, until tender but still holding its shape. Transfer the pumpkin to a serving bowl. Peel the garlic cloves, smush them up and add them to the bowl. Gently stir through the coriander and chickpeas. Whisk together the lemon juice, remaining tablespoon of oil, and the ginger. Pour it over the salad and gently stir it through. Ross McClennan, one of our favourite musicians, recently put on a big gig at the newish Brunswick pub The Spotted Mallard. Having found their food pretty satisfactory on our first visit, we booked a table and turned it into a dinner & show combo. It's a lovely, lovely space - an old ballroom that has been minimally renovated into a quaint and stylish pub. They've got a great range of beers, friendly staff and the vibe is generally busy but not unpleasantly crammed. The menu has changed a bit since our earlier visit - gone is the reasonably successful mushroom burger, replaced with a chickpea and vegetable version served with red onion relish, pickles, rocket and tomato chilli jam plus chunky fries and coleslaw ($19). This is an improvement - the patty is tastier and easier to eat than the mushroom one and the trimmings combine sweetness, spiciness and saltiness in excellent proportions. The bun is briochey, which means this isn't vegan by default, but the menu makes it clear they can do it animal-product free. Cindy was very excited by the sound of the wild mushroom pot pie, stuffed with handpicked mushrooms cooked in a creamy sauce ($20). This was great as well - golden, flaky pastry covering a rich and hearty stew. Perfect winter fare. The Spotted Mallard is a lovely addition to Sydney Road - it's a warm and welcoming room with good food and drinks and a steady stream of interesting gigs to keep things interesting. The service has improved out of sight from the teething problems we hit just after they opened - they had a pretty full room on Saturday night and still pumped our food out quickly and well. We've been a semi-regular presence there since they opened, and this visit did nothing to dampen our enthusiasm. Read about our first trip here. Since then, Proof that Dancers Eat and The Burger Adventure have loved it, while Parma Daze and mangiabeve have been a little less enthused. Accessibility: The Spotted Mallard's dining area is located up a wide flight of stairs, and some tables are accessed via further stairs; we didn't see any alternative means of entry. Tables are well spaced. All food and drinks are ordered and paid for at a high bar, then food is delivered to the table. Helados Jauja has been churning up Lygon St's richest, creamiest ice creams for a couple of years. Recently owner/manager/recipe developer Po Lin contacted us because she's keen to extend their repertoire to more vegan friendly options. We shared what we knew about dairy substitutions and a month or two later she's bounced back with chocolate sorbet! Free of dairy, soy, nut or any other kind of milk, this is a dark chocolate delight with all the taste and even some of the texture of a high-cocoa-content block. Helados Jauja pride themselves on all-natural ingredients and no extra colourings, and thus their fruit sorbets have been incidentally vegan all along. The lemon is striped with real zest and has only the gentlest acidity, while the black currant (pictured above, in a $7.50 cup) offers a tarter contrast to the chocolate. There'll likely be many more fruity flavours appearing as the weather warms up too. Though nothing's unambiguously marked, I believe 'sorbet' is code for 'vegan' - in any case, the staff are sweet to a fault and open about their ingredients so step in and quiz them to your animal-lovin' heart's content. These icecream artisans have also introduced a weekend brunch menu centred around panqueques, (non-vegan) Argentinian crepes stuffed with meat, mushrooms or dulce de leche. Po Lin treated me to a taste and I think I'll be back to order more. Casa Del Gelato across the street still have the widest range of vegan-friendly gelati, but I'm excited to see a soy-free alternative. I'll be keeping a keen eye on Helados Jauja's flavour rotation this spring. Po Lin offered me tastes of a half-dozen ice-cream flavours and cooked me complimentary crepes. I paid for my own ice cream cup and am blogging of my own volition, 'cause I dig businesses that dig vegans. You can read about our first visit to Helados Jauja here. Since then it's received much blog love (with the occasional exclamation about the high prices), see MEL: HOT OR NOT, Let Me Feed You: Melbourne, I'm So Hungree, dear melbourne,, Let's Get Fat Together, new international students, Ballroom Blintz, Ichigo Shortcake, The Not So Lonely Planet, Poppet's Window, EAT AND BE MERRY, FOR TOMORROW WE DIE(T) (comped), Yellow Eggs, Popcorn & Toast (comped), a moment with Madam Meko... and Gastrology (comped); thoughts are more ambivalent on sakiikas and PETIT MIAMx. Accessibility: The ice cream counter is a single step up from the main footpath, plus there's an alternative ramp (see photo above). In good weather, stools out front can be rearranged to your preference; inside is more crowded. I ordered and paid over the high icecream display case. We're always on the lookout for new pubs to go pub-clubbin', so when @beergirlbites told us The Woodlands Hotel in Coburg did some okay veg dishes, we added it straight to our agenda. It's a funny looking pub - almost like a weird fantasy land. The tables upstairs have a few giant thrones, the beer garden a strange sculpture and the main bar is dotted with strange little cabinets of oddities and has a couple of biplanes hanging from the ceiling. It's visually very busy (we should have taken more photos!). The Woodlands prizes itself on its local beer selection - they have rotating taps and a fridge full of bottled options. I had a couple of very tasty Boatrockers. The menu (pdf here) isn't as veg-friendly as we were hoping - there's a single main, one share plate and a few sides. We gave it a pretty good workout - Cindy went with the share plate and a side. The share plate was a beetroot carpaccio with saganaki, baby beetroot and smoked almonds ($16). This pretty fancy for pub food - delicately sliced discs of beetroot and slivers of salty cheese, topped with baby beetroot bits and pieces and smoky almonds and a nice light dressing. Alongside it, Cindy ordered the green beans with shanklish and preserved lemon ($9). There's nothing very complicated about this dish, but it's an excellent combination of flavours - salty, tangy cheese and some citrussy lemon pieces on a lightly cooked pile of beans. I chose the one veggie main, Mauritian pumpkin & butternut squash curry with pilaf & roti ($26). This hit the spot pretty impressively - the rice was lightly spiced and well cooked, the roti done reasonably well and the curry itself spicy and nicely put together. Tucked behind the roti was a little pot of quite spicy chutney, which added a bit of an extra kick. It's hard to justify paying $26 for it, but it was a reasonable meal nonetheless. We decided to go the whole hog and sample the dessert menu, opting for the baked hot chocolate mousse with cumquat marmalade and creme fraiche sorbet ($14). This was probably the highlight of the night - the mousse was rich and chocolatey with a good hit of tart cumquat which was tempered by the creamy sorbet. It was probably wise to split it between two because it was pretty rich. The Woodlands Hotel is a solid addition to Melbourne's pub scene, pushing out into Coburg (following the trail blazed by The Post Office). Having said that, it's not really pumping out a wide range of vegetarian options - if we went back we'd more or less be ordering the same dishes - and the prices are pretty high. Given the ridiculous veg-friendliness of most of the inner-North's pubs, it's unlikely we'll be hurrying back for a second trip anytime soon. There are a handful of positive reviews of The Woodlands out there, predominantly meat-tastic: see Parma Daze, RedWineCyclist, A Life in Melbourne and rosblogger. Accessibility: The entryway has a tiny step and the interior is reasonably spacious. The toilets are accessed via the beer garden (I didn't notice a specifically accessible option, but the gents wasn't ridiculously small). You order and pay at the bar.